Hosting a formal, elegant wedding? Learn all the details on proper wedding invitation etiquette. Traditionally, the bride's parents host the wedding. Although today, many couples host their own wedding or host together with their families. There are many options for this portion. See details below. Always list the bride's name first. Followed by the groom's full name–first, middle, and last. Formal etiquette requires spelling out the full date and time. Please note there is no "and" between the year. Traditionally, only list the venue and city, state. See further details below. This is the most common phrase to use, but you can also use another variation, such as "dinner and dancing to follow". There are many variations of listing wedding hosts. If all parties are hosting the wedding, you can say "Together with their families" or you can include the bride and groom's parents on the first two lines. If the groom's parents aren't hosting but you still want to include them, it is proper to list them beneath the groom's name using the phrase "son of Mr. and Mrs....". The phrase "honor of your presence" is only used for weddings held inside of a church or place of worship. This does not mean you are not having a religious ceremony or a formal event, it is simply proper protocol. For weddings outside of a place of worship, use "pleasure of your company". Especially formal events use the British spelling, such as "honour of your presence". However, it is also acceptable to use the American spelling, "honor". Always list the bride's name first. Use the bride’s first and middle names if she shares the same name as her parents. Courtesy titles (such as Miss or Ms.) are typically not used. The groom's full name should be listed, even if his parents' names are included. Especially formal weddings may use a title for the groom, such as Mr. Traditionally, only the venue name and city, state should be included. For those with many out of town guests or for a destination wedding, it is acceptable to list the street address. You may also include the street address if your wedding is held at a private residence. Always list your ceremony location on the main invitation. You may add "reception to follow" on the bottom of the invitation for stylistics purposes, or you can omit. It is recommended to list reception venue information on a separate details card, if it is being held at a different venue than your ceremony. If you are having a black-tie wedding, I recommend listing this somewhere in your invitation suite. Traditionally, it is listed in the bottom right corner of a reception insert or other enclosure card. You may also list it in the bottom right corner of the invitation, if necessary. Like registry information, some guests may be offended if you list adults only, no children, or some variation on the main invitation. Let guests know this detail by addressing envelopes to the parent(s) only and by word of mouth. If you prefer to have it listed, I recommend listing on a separate enclosure or on your response card. It is considered too forth-coming to list your registry on the invitation. If you wish to follow proper etiquette, you can direct guests to your wedding website, where you can link to your registry. Of course, many brides today like to include gift details in their invitation suite. It can be especially convenient for those having a large wedding, and many guests may be interested in this information as well. In this case, I recommend including it on an enclosure or small registry card, but never on the main invitation. It is preferable to list website details on a separate enclosure, as web addresses can clutter the design of your invitation. Invitations can be formal or informal, and these days you'll see many variations of both. Call me old fashioned, but I believe in using proper etiquette for anything you are writing. All formal written material has guidelines–from newspapers to books and beyond. Guidelines are set in place to help readers know what to expect. It's not a matter of being stuffy or snooty, it's just good English. Of course, I am happy to accommodate any special requests you may have. My stationery follows a traditional line-by-line design, so you can choose formal or informal wording. All of your questions–answered! 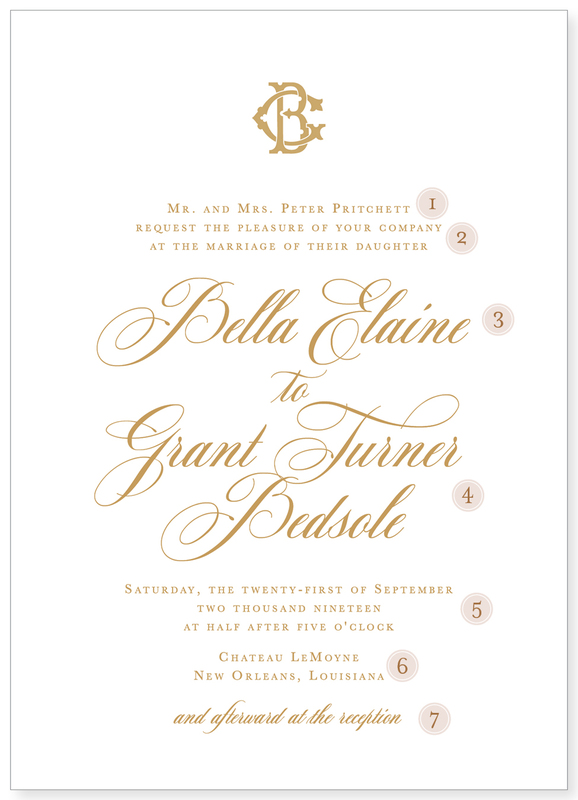 Learn more about wedding stationery and etiquette.